The care of patients treated with BBBD requires a multi-disciplinary team approach. The team includes a neuro-oncologist, neurosurgeon, neuroradiologist, anesthesiologist, pharmacist, nurse coordinator, neuro-psychologist, ophthalmologist, audiologist, physical therapist, and social worker. BBBD treatment is done on two consecutive days every four weeks for up to one year. Patients undergo baseline neuropsychologic evaluation, electrocardiogram, and port-a-cath placement. At baseline and prior to each monthly BBBD treatment patients undergo neurologic and KPS evaluation, brain MRI, chest X-ray, complete blood count, chemistry panel, and urinalysis. Patients are required to have adequate hematologic, renal, and hepatic function, and must have adequate pulmonary and cardiac function to tolerate general anesthesia. Ophthalmologic assessment is done if clinically indicated. Patients treated with carboplatin in conjunction with BBBD undergo monthly audiologic assessment. 3. Absence of uncal herniation. 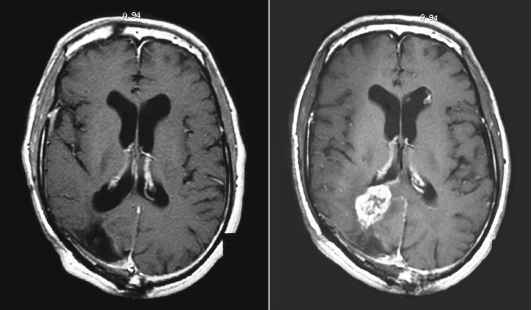 In the setting of rapidly progressing brain disease with associated rapid neurologic deterioration, there is a risk of increasing mass effect following BBBD, thus BBBD is the safest before tumor burden becomes excessive .